Ten middle school science teachers were recently selected for the 2017 class of a professional development and networking program led by researchers and education leaders in Kentucky that aims to reach and inspire future scientists. Western Kentucky University’s The Gatton Academy of Mathematics and Science in Kentucky runs the National STEM Scholar Program, which provides nationally competitive scholarships to science teachers. Funded through a grant from the nonprofit research organization National Stem Cell Foundation (NSCF), the program is designed to inspire the next generation of STEM (science, technology, engineering and mathematics) innovators by “training the trainers,” according to the announcement. Among a pool of applications from 25 states, 10 teachers across eight states (FL, KT, ME, MN, NJ, NY, WA and WI) were selected for the second cohort of the five-year program. They were hosted between June 4-10 at Western Kentucky University, where they participated in “hands-on, minds-on” activities and conversations with STEM education thought leaders at WKU. In addition, each scholar was tasked with creating a “challenge project” for classroom implementation, according to the program website, and received a Chromebook and funding to support the project. 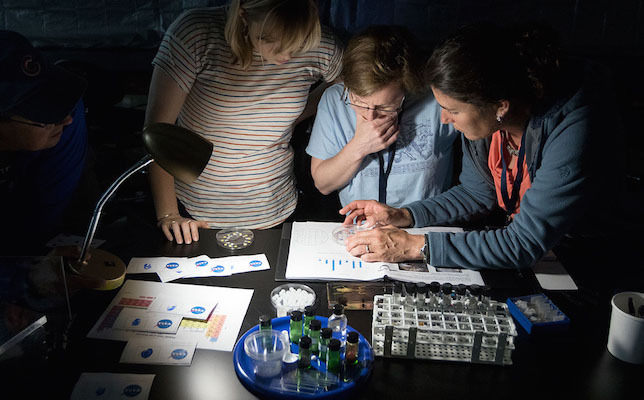 Teachers from Washington, Wisconsin and Maine (above) worked together during an escape room activity that tasked scholars with solving clues using microscopes they constructed earlier in the day. Image Credit: National Stem Cell Foundation. All of the participating teachers have been sponsored to attend the National Science Teachers Association conference next year. The Gatton Academy of Mathematics and Science is a public academy and an early college entrance program at Western Kentucky University. Further information on the program is available on the WKU site.